So for post #2 on the crafting portion of the room make over! It’s going well and the crafting is coming along. I wish I could get more done, more quickly, but with running a home and homeschooling its just going to take some time to get it all done. Sometimes I feel like I get so distracted coming up with new ideas or figuring out what I want to work on next! So what did I do this week? Well it started with a trip to the thrift store… actually I did that last week when I purchased the scarf for the pillows I recovered. I also purchased a sheet for $2 to make into simple curtains for the front window. All I did was cut the fabric lengthwise, hem it and add an extra seam at the top to form a tube for the curtain rod to be fed through. Then I washed and ironed them and voila! Finished! SO quick and easy. Now that the red curtains are down and these are up there is so much more light coming in the windows and it seems so much bigger and open in our living room. 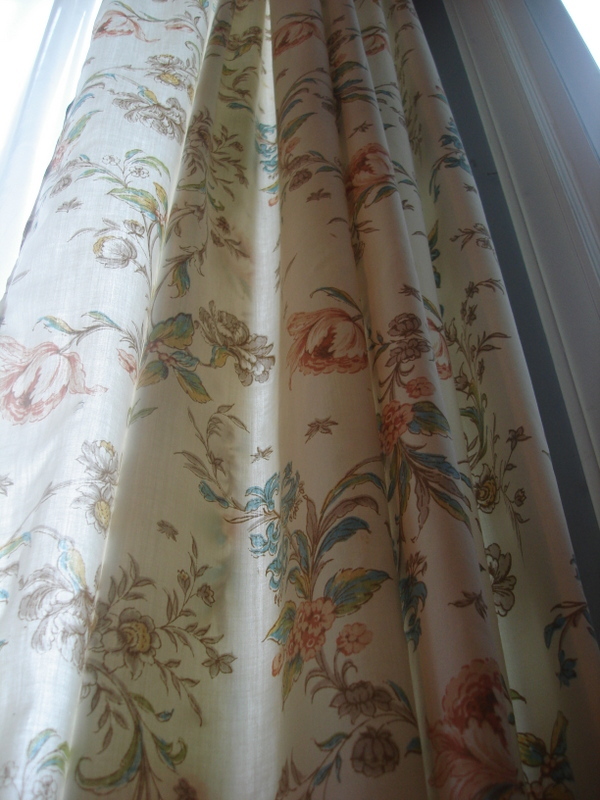 I also tied the sheer curtains on the side windows into flowers and pinned to the side. I may attach some ribbon later, but I haven’t completely decided on that. I have one more window and a set of double doors to the patio that are in the adjoining room. They don’t have to match, but the gray wall color is in the whole downstairs because it is a very open floor plan and hard to find good places to divide rooms. But I don’t mind! I just need to find another sheet that isn’t the same, but compliments the front windows. One idea I had was to get about a dozen scarves (the sheer ones) of complementing colors and designs and sew them together into curtains. I may just do that for the double doors…. we will see. That isn’t part of this project so I’ll save it for another time since it is a different room! 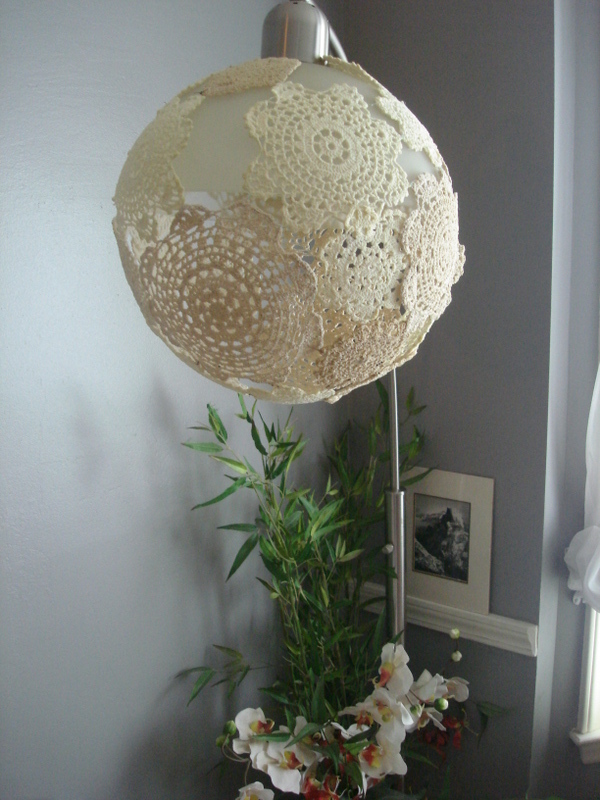 Another pintrest idea that I came across and loved was the doilies made into a circular lamp shade. I have a utilitarian, but not decorative lamp in the living room that works and does it’s job, but not inspiring at all. I received a few doilies from my mother-in-law that I had no use for and I repurposed some from my Mom! It turned out fantastic! There are lots of links to how to do it all over the web, but I used this one from Dosfamily.com. I blew up a punch balloon since they are pretty round and not oblong and then made sure I had enough doilies to cover it. I was a little short, but made it work. I also used smaller ones than on this blog and I sewed them together to make sure they didn’t fall apart. Once the balloon was covered I made a mixture of 50/50 wood glue and water and then saturated the doilies. Let it dry overnight, pop the balloon and you have a new lampshade. I do love the way it turned out, but if I do it again the only thing I would change is to make sure I had more doilies so that they overlap and there aren’t any open spaces between them. But otherwise it turned out just as I wanted! The last project I did were some balls made out of string. These I have sitting in a little glass blown dish that hubby gave me for Christmas. The balls were made very similar to the way the lampshade was done. First I blew up 4 water balloons (without the water in them of course, although my children could fathom why I would blow them up without water!). Then I cut varying lengths and colors of string and soaked them in a mixture of 50/50 elmers glue and water. Then over a covered surface I wound the string in a crisscross pattern around the balloons. Again, I let it dry overnight, pop the balloon and they are done! 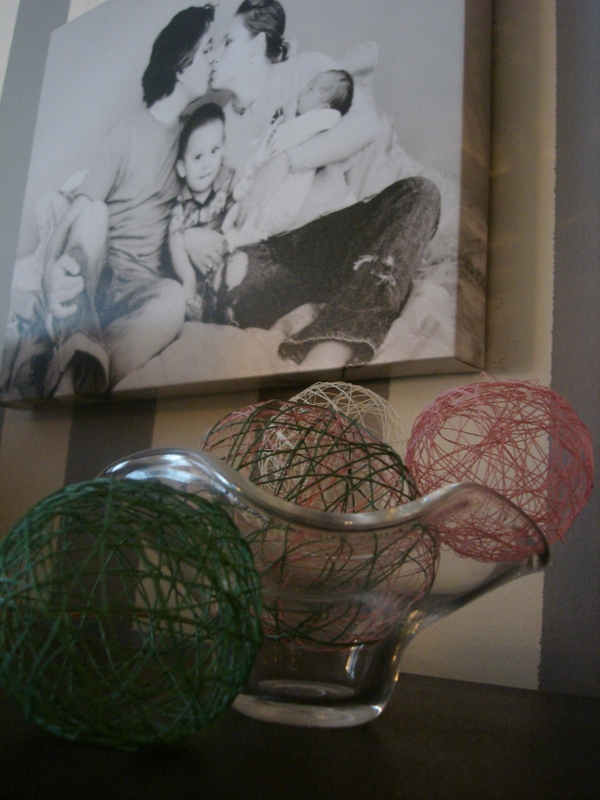 So many fun new decorations that were super inexpensive to create or free, if you have all the materials on hand. Part of the reason I decided to make some of these was because I did have everything I needed to make them! I have taken a few photos of the projects, but hopefully I’ll be able to post a few photos of the whole room once it is complete! Stay tuned for more! Next are a few painting projects!